To see such a cluster of dolphins in one place is a rarity. Recently, the scientist met a record-large flock of bottlenose dolphins. Afalins (Latin Tursiops) are the most common dolphins: they live in warm and temperate waters around the world, except in Arctic regions and the Antarctic Circle. They feed on fish and are able to hunt for it independently, but most often there are groups of 30-70 bottlenose dolphins: apparently, such a number of members of the pack is optimal relative to the food base of most seas. But sometimes bottlenose dolphins form giant associations: separate small groups are poured into larger ones. 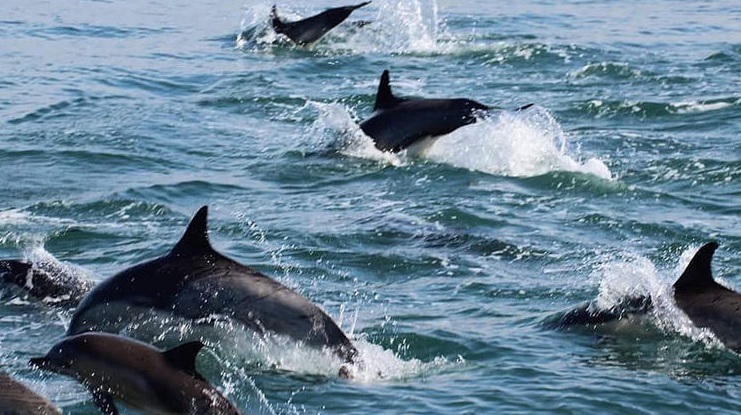 Scientists know flocks of bottlenose dolphins, numbering several hundred individuals. Biologists who studied the Indo-African population of bottlenose dolphins (Latin Tursiops aduncus) noted that in recent years even small schools of dolphins have “enlarged”: if in 2008 there were groups of 18-20 individuals off the coast of South Africa, In 2016, the average pack consisted of 76 members. And recently in the water area of ​​the South African East Cape province, scientists noticed a group of six hundred bottlenose dolphins. There is no exact explanation for this; presumably, the bottlenose dolphins have to be more actively united to protect themselves from white sharks, which are becoming more and more in this area.